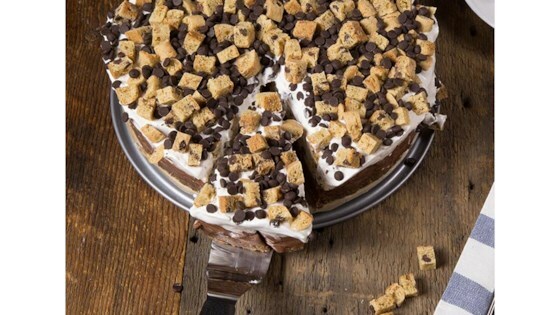 "This frozen cake brings together our Gluten-Free Cookie Dough and Dairy-Free Coconutmilk pints, adding them to a scrumptious cookie crust." Set the pints of Coconutmilk frozen dessert on the counter to soften. Line a 9-inch springform pan with parchment paper. Combine cookie crumbs with the vegan butter. Press the crust mixture flat in the pan and chill for 15 to 20 minutes. Once the Chocolate frozen dessert is soft, pour it onto the cookie crust and smooth flat; freeze for about 15 to 20 minutes, until the surface is firm again. Repeat this with the Gluten-free Cookie Dough frozen dessert. Top the cake with CocoWhip and freeze for at least 2 hours before garnishing with chopped cookies and mini-chocolate chips.